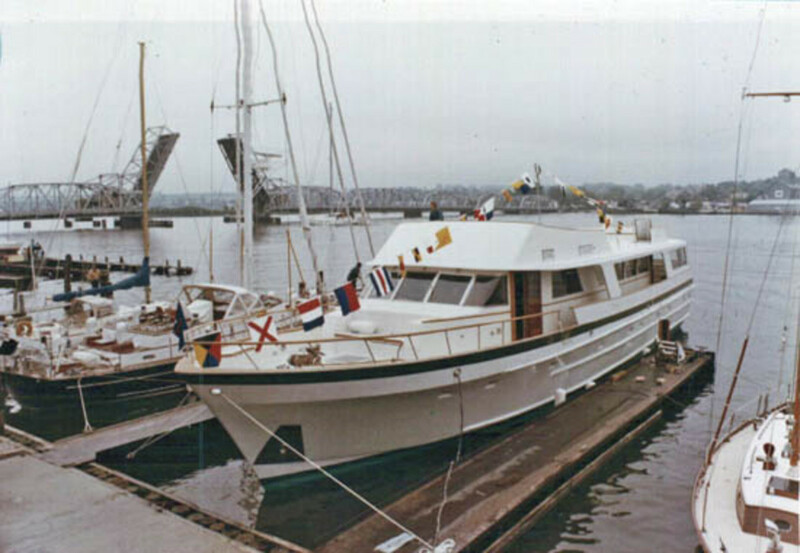 An extensive refit, complete with two Seakeeper gyros, put this Vintage Palmer Johnson on an even keel. Charlie Dock at Newport Shipyard was filled with sailors putting last-minute touches on their 100-foot sailboats in preparation for the 2011 Transatlantic Race. 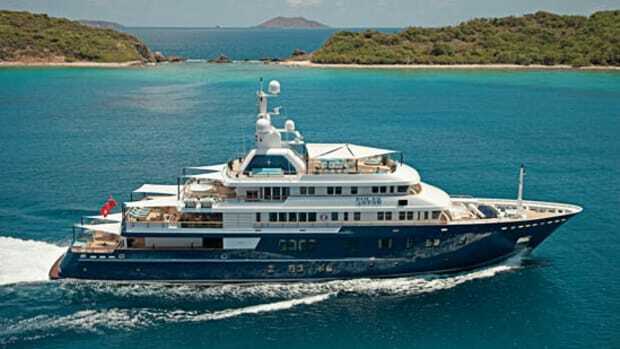 As I walked out to the 102-foot motoryacht Banyan, I passed crew carrying helm wheels and long sections of pipe to their vessels. Banyan has a lengthy pedigree. 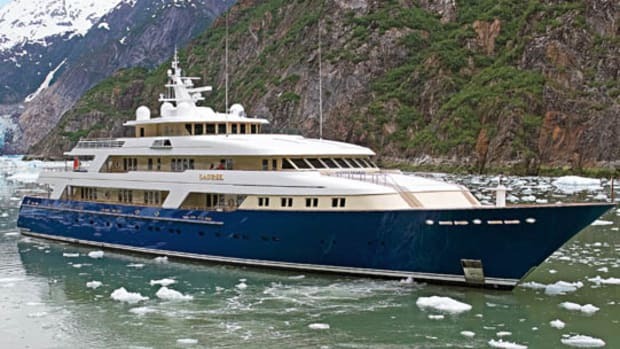 Designed by Sparkman & Stephens and launched in 1980 by Wisconsin-based Palmer Johnson, she’s seen a lot of changes over the last 30 years, but none as extensive as her last refit. 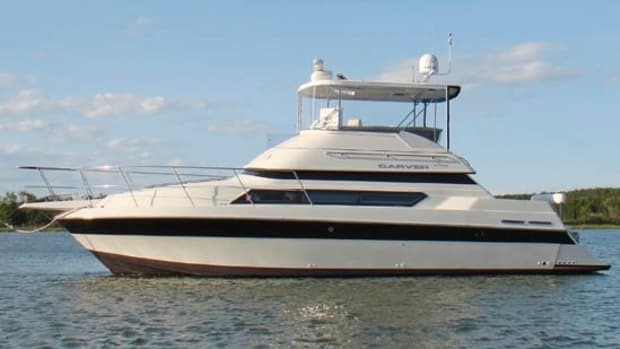 After a year at Lauderdale Marine Center, she was relaunched with a 14-foot cockpit extension that houses two Seakeeper gyros plus many interior and engine changes. I had just enough time to climb aboard Banyan if I wanted to get a close-up view of the 289-foot sailing yacht Maltese Falcon as she departed. It was the second day of starts for the race, and she was scheduled to shove off at 2 p.m. The timing turned out to be perfect. The number of spectator boats combined with three- to four-foot confused seas created the ideal conditions to test Banyan’s new gyros. She’d already been equipped with Naiad fin stabilizers, but her owner wanted to add zero-speed units as well without adding more through-hulls. 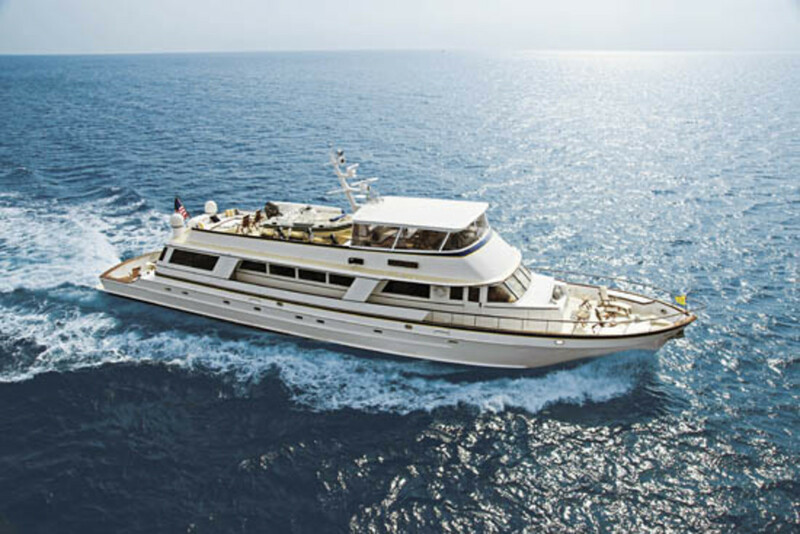 In addition, the aluminum hull extension had changed the yacht’s center of balance. 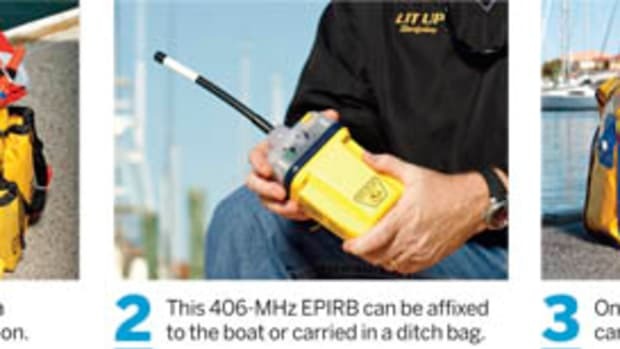 It was these two considerations that led the owner to add the two Seakeeper M7000As. Capt. Andrew Grego piloted Banyan into the fray of spectators where we sat with the gyros off and the fin stabilizers on. We were rocking at a 15-percent roll, but as soon as the Seakeepers were flipped on, that dropped to an approximately a seven-percent roll. That was the difference between needing to hold a railing and walking unaided. In fact, when the gyros were flipped off again, an unlatched fridge on the flying bridge opened and launched its beverages across the deck. Then it came time to put both the gyros and fins to work while underway. The Vineyard Fast Ferry was headed in our direction, so Grego radioed over with the simple request that they “wake the hell out of us.” A bemused affirmation of the request came in reply, and Banyan headed right into the waves. An empty plastic water bottle near me remained upright, and I could hardly feel a bump. The change in center of balance, rudders and prop location, and a repower also provided other advantages. Banyan’s cruising speed is now 2.5 knots faster at the same rpm with a decreased fuel burn and her top speed has increased by 5 knots to 22 knots. 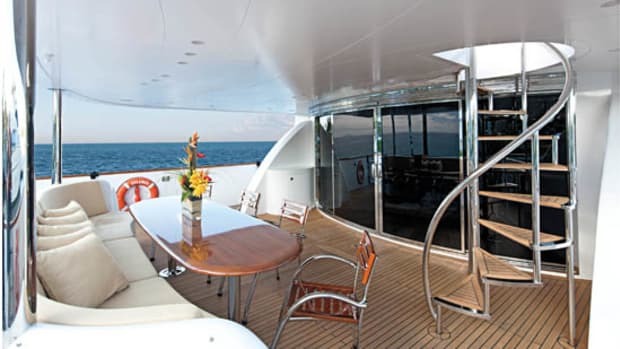 There was also an aesthetic improvement: The extension made the 30-year-old yacht appear more in line with current design trends by providing additional outdoor space that is close enough to the water to fish from. There’s now more room to fish and store toys, and getting in and out of the tender and water is easier. In addition to the extension and stabilizers, Banyan’s engines were upgraded to twin 875-hp Caterpillar C18s, which are more powerful yet more compact than the previous engines. To remove the old engines, craftsmen at Lauderdale Marine Center cut a large hole in the hullside the size of the new smaller engines. The larger older engines were first dismantled while still inside the hull, then removed piece by piece, after which the new CATs were lifted by an A-frame, slid in, and then lowered and mounted to the stringers. And the system upgrades didn’t stop in the engine room. From bow to stern, equipment was added or replaced. 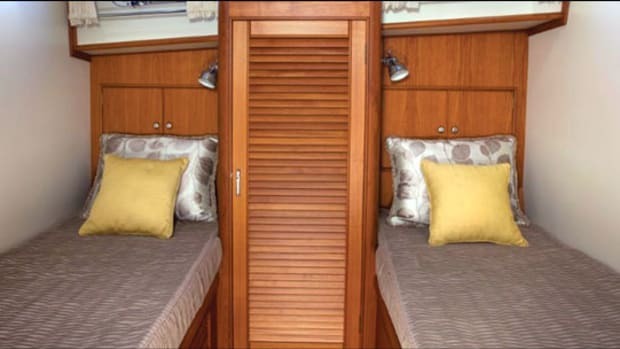 Banyan’s windlass, bow and stern thrusters, freshwater systems, and air-conditioning piping, insulation, and compressors are all new. 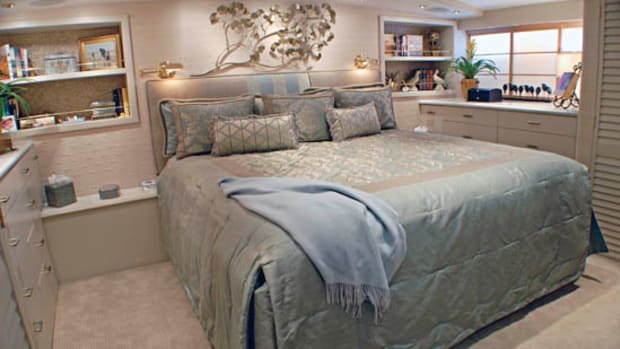 Most of the upgrades were designed under the owner’s directive to make the yacht as quiet as possible. So the hull around the master stateroom, with his and her heads, ended up surrounded by four inches of dead air to muffle the noise of the engine room. Even the new Bosch galley appliances were chosen for how quietly they run. 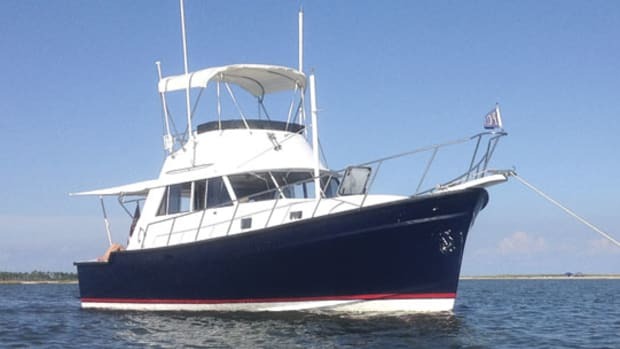 Such an extensive refit completed in just a year and under budget wouldn’t have been possible if it weren’t for a knowledgeable captain and a hands-on owner. 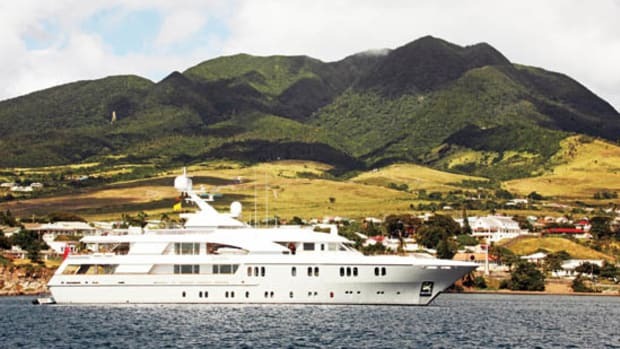 Grego has been at the helm of Banyan for nearly seven years, which allowed him to offer changes that make the yacht easier to run with a standard three-person crew, which includes a chef and his wife Karen, a captain’s license-holding stewardess. At the end of my stability test, Maltese Falcon was well into the Atlantic, and we were well on our way back to Charlie Dock. It was a new beginning for Banyan whose future is as steady as it is bright.